Sanjay Nirupam scores a self-goal. Gets schooled by Twitterati for sharing a photoshopped image of Narendra Modi. 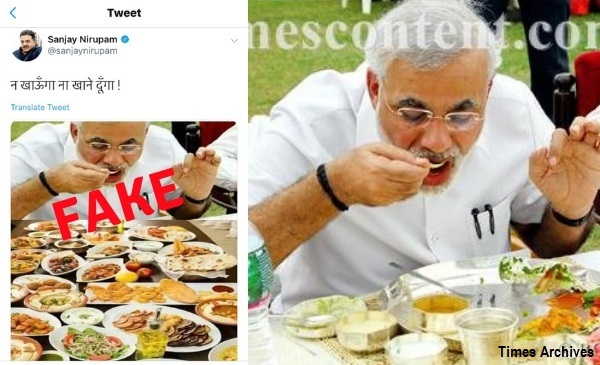 Sanjay Nirupam, president of the Mumbai Congress Committee scored a self goal on Thursday by tweeting an old photoshopped picture of Prime Minister Narendra Modi that purports to show him eating from a lavish spread. View an archived version of Nirupam’s tweet here. The image tweeted by Nirupam is poorly photoshopped. 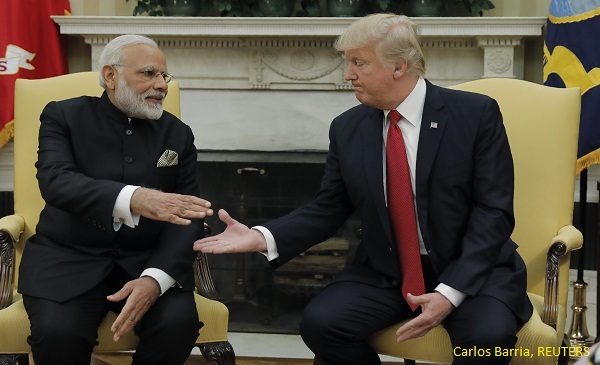 The unnatural looking edge of the table and hands of the prime minister give it away. Despite many pointing out that the photo was manipulated, Nirupam’s tweet was still visible at the time of writing this story and received more than 2,200 likes and 600 retweets. BOOM was able to find the original photo through a reverse image search. We were able to trace the original picture to TimesContent.com‘s photo archives. The description of the image states, ‘Chief Minister Narendra Modi relished his food during the annual Diwali lunch party organized by him for journalists in Gandhinagar, Gujarat on November 12, 2008’. Update: After BOOM’s story Sanjay Nirupam said that his tweet was meant in jest and that it shouldn’t be taken seriously. 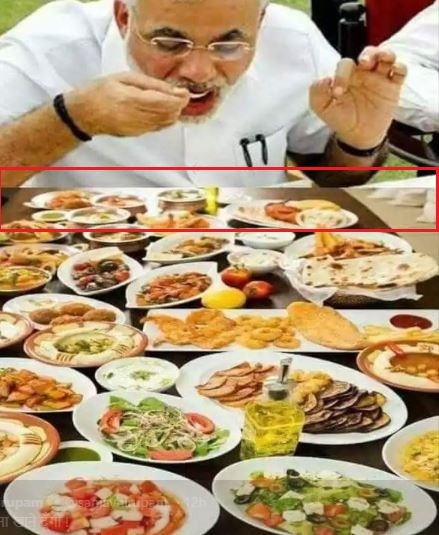 Other photoshopped images of Narendra Modi eating non-vegetarian food have been debunked in the past. 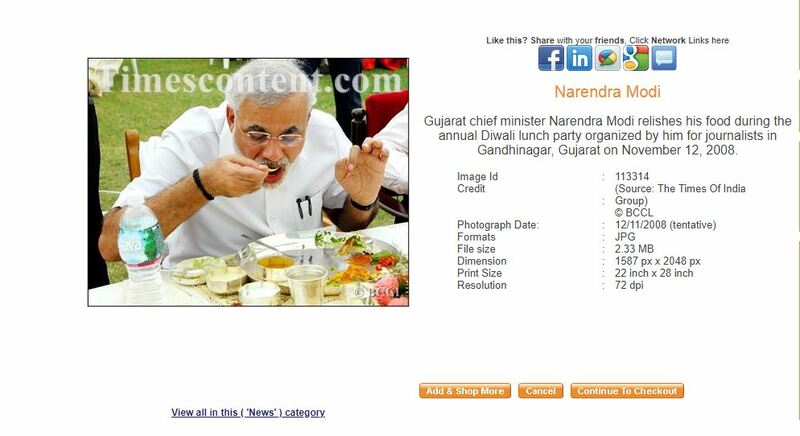 Last year, a similar image of Modi from the same event that purported to show him eating beef had gone viral in April. 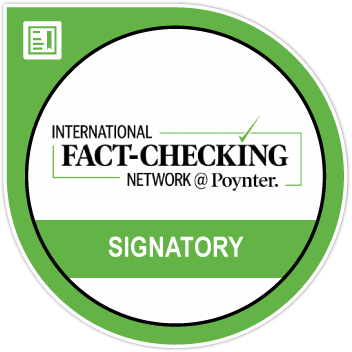 Fake news buster SMHoaxslayer had debunked it at the time. The prime minister is reported to be a vegetarian. This is not the first time Sanjay Nirupam has shared a fake picture. In 2016 Nirupam also shared a photoshopped image that claimed to show members of the Rashtriya Swayamsevak Sangh (RSS) giving a guard of honour to the Queen of England. The image is a composite of two separate photos. The fake picture was again debunked by SM Hoaxslayer .